The resizable left-side panel displays an AP list of the APs detected by the scanner or the ones that are present in the imported projects. The central area is used for displaying the floor or site plan image, survey paths, and visualizations of analyzed data. The resizable right-side panel allows you to manage project floor plans and collected survey data, as well as to configure various project options and settings. You can hide and show the left and right panels using the vertical splitter or through the menu commands View => Left Panel and View => Right Panel. 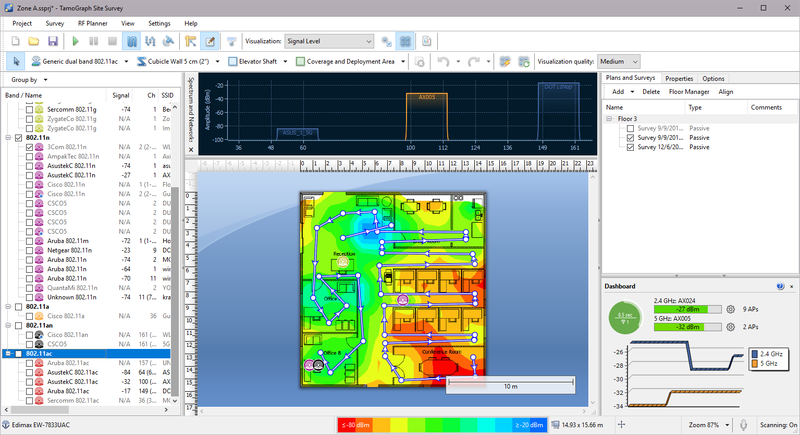 In addition to the three main elements, the application contains the main tool bar (provides quick access to frequently used commands), the RF Planner toolbar (used in predictive modeling for drawing virtual objects; not shown by default), and the status bar (provides information on the wireless adapter and scanner status, current floor plan dimensions, coordinates, and zoom level, as well as the legend for the currently selected visualization). The following chapters describe the functionality of these elements in detail.